Recombinant human bone morphogenetic protein-2 (rhBMP-2) generally provides high rates of clinical improvement and fusion. However, rhBMP-2 has been associated with adverse effects. Recently, a beta tricalcium phosphate (β-TCP) bone substitute has been developed. The aim of this study was to determine the fusion rates and clinical outcomes of patients treated with β-TCP compared to rhBMP-2. 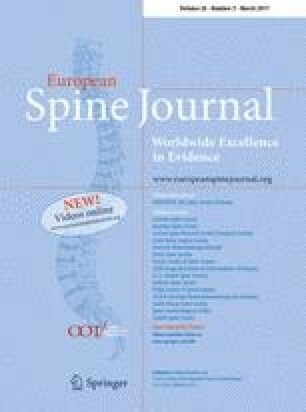 One hundred and thirty-five consecutive patients who underwent lateral lumbar interbody fusion with β-TCP (n = 25) or rhBMP-2 (n = 110) in the interbody cage were included in the study. The 25 β-TCP patients were a group of consecutive patients from numbers 46 to 70. Clinical outcomes included back and leg pain, Oswestry Disability Index (ODI), and SF-36 physical and mental component scores (PCS and MCS). CT scans were performed at 6, 12, 18, and 24 months until confirmation of solid interbody fusion, with no further scans performed once fusion was achieved. Targeted CT at the operative level(s) was performed to reduce radiation exposure. At 24 months there was no significant difference between clinical outcomes of the β-TCP or rhBMP-2 patients, with improvements in back pain (46% and 49%; P = 0.98), leg pain (31 and 52%; P = 0.14), ODI (38 and 41%; P = 0.81), SF-36 PCS (37 and 38%; P = 0.87), and SF-36 MCS (8 and 8%; P = 0.93). The fusion rate was significantly higher for rhBMP-2 with 96% compared to 80% for β-TCP (P = 0.01). Separating patients into those with a standalone cage and those with supplemental posterior instrumentation, there was no significant difference between instrumented fusion rates of the β-TCP and rhBMP-2 patients at 6 (P = 0.44), 12 (P = 0.49), 18 (P = 0.31) or 24 (P = 0.14) months. For standalone patients there was a significant difference at 6 (P = 0.01), 12 (P = 0.008) and 18 months (P = 0.004) with higher fusion rates in the rhBMP-2 group; however, by 24 months this was not significant (P = 0.18). Comparable clinical outcomes and complication rates suggest that β-TCP is a viable alternative to rhBMP-2. The difference in fusion rates for the standalone patients suggests that β-TCP may require supplemental posterior instrumentation to enhance fusion. The authors wish to thank Dr Carl M. Blecher FRANZCR DDU for reporting the CT scans. No funds were received in support of this work and no study-specific conflicts of interest exist with any of the authors. GMM has received travel support from Globus, Medtronic, NuVasive and Stryker. RMP has received travel support from NuVasive.